Strategic leaders must not get consumed by the operational and tactical side of their work. They have a duty to find time to shape the future. As the world is changing at an increasing speed, learning and innovation faster than competition is the only long-term sustainable competitive advantage. Innovation is a huge topic with many books written about it, and I have no ambition of covering it in full. That said, in this post I’ll go through an innovation model that ensures you put people first and use digital technology only as the means to improve people’s lives, not the end itself. …and that e-mail gave birth to Airbnb. Joe, co-founder of Airbnb, took the concept of an air mattress and turned it into a rapidly growing company. Founded in 2008, it has since expanded to over 34,000 cities and 190 markets around the world. However, the innovation of this new business model is by no means finalized yet. Airbnb faces many regulatory hurdles and other challenges. Despite this, they are 10 steps ahead of all major hotel chains in capitalizing on the sharing economy, and that in itself the market concludes is worth a company valuation of 25+ bn$. This links back to the importance of learning. Innovation is all about taking all the learning you gain and translating it into innovation in the marketplace that makes life better for the customer. 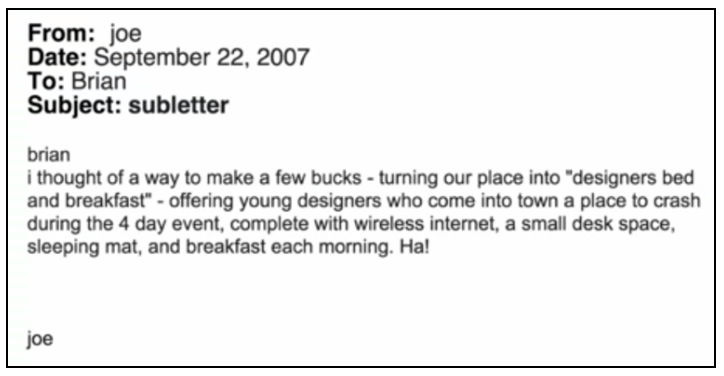 It’s important to acknowledge that learning and innovating fast is more important than making things perfect from the get go, just like Airbnb’s idea wasn’t perfect with that first e-mail Joe sent. What would have happened if an employee at Hyatt Hotels Corporation, one of the biggest hotel owners in the world, would have sent the idea to their CEO? Would there be an innovation process in place to capture, nurture, test and evaluate it to create a department worth 25+ bn$? Dedicated time – Working a full day with a diverse team on generating solutions via various exercises is great. Focus is seldom a bad strategy. Idea periods – Asking people to during the coming month zoom in on ideating solutions for a specific challenge. Everyone could have one common shared document where they add ideas they get on the subway, in the shower, and when trying to fall asleep. Sharing these data points with everyone involved in the solutions creation process will help them understand the reality of what you are creating a solution for instead of projecting only your own subjective thoughts on the challenge. The data points in themselves will also trigger lots of exciting ideas. 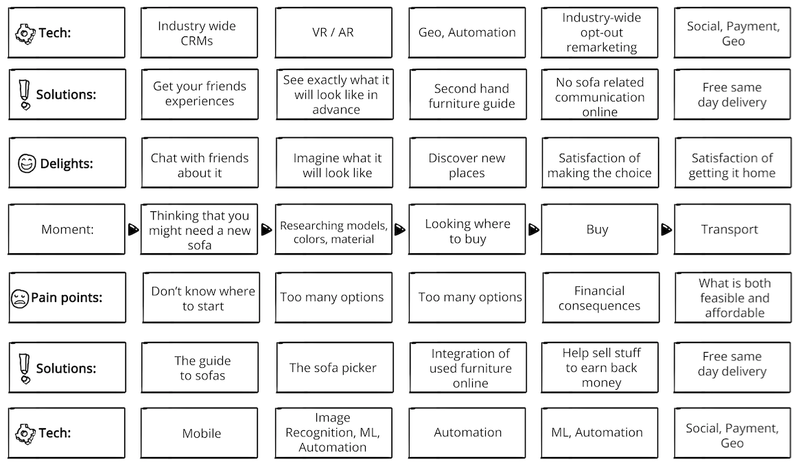 The sofa picker using image recognition, machine learning and automation: This could be a mobile site that asks you to shoot a video in the room where the sofa will be placed, turning 360 degrees. In addition it asks you to take a photo of your five favorite furnitures in your home, whatever they may be. It will then suggest the top-3 options of sofas, and they will make you feel “Wow! It’s amazing how spot on these recommendations are, you just saved me a lot of time!”. These will be sofas that matches the colors in the room, that fits measure-wise and that is the style of your favorite furniture. See exactly what it will look like in advance using VR / AR: If you are a furniture company, instead of sending out a big catalogue, you can simply send out a VR/AR app together with cardboard goggles for your smartphone and have people walking around in their home placing things exactly where they want them so there is no concern about what something actually will look like once they buy it. A note on solutions: Big ideas are actually often easier to execute than average ideas. Think about it. A bold idea is just more attractive, to resources, capital and talent. People just want to be part of it. An average idea is one where you likely have to do all the work yourself. So when you think about solutions and plans in general, don’t be afraid to make them big. A = Number of people impacted by the innovation. B = Improvement vs today: This will include judgment as the improvement can be in different areas, e.g. 50% faster/cheaper, 30% better etc. D = Feasibility. A number between 0 and 1 that will include a lot of judgment as well but serve well as a direction. E = Link to mission. This is either 1 or 0, nothing in between. So either your innovation fits with your mission, or the total equation will equal zero. 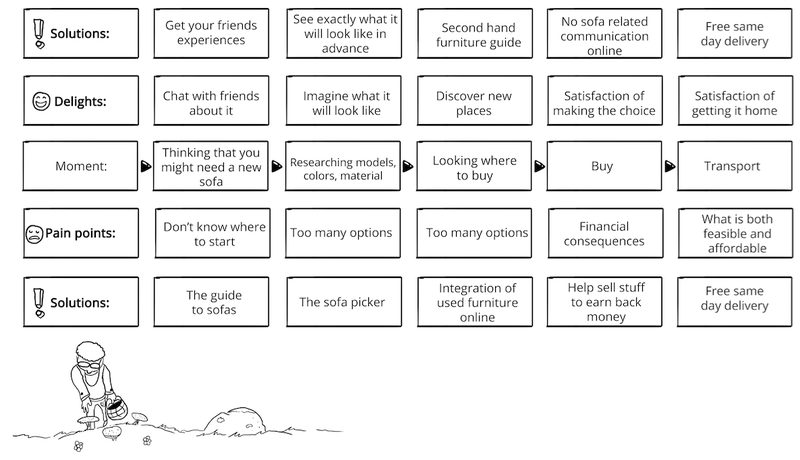 A Let’s say you sell 100,000 sofas/year and you assume the initial adoption would be 5% based on a qualitative study. This number would be 5,000. Let’s say you sell 100,000 sofas/year and you assume the initial adoption would be 7% based on a qualitative study. This number would be 7,000. B B = Let’s say people assess this to be 3x as good as looking around themselves, so this number would be 3. B = Let’s say people assess this to be twice as good as trying to picture it themselves, so this number would be 2. C C= Let’s say you assume that you can charge the corresponding amount of an App in overall extra profit, so 1 $ for the sake of simplicity. C= Let’s say you assume that you can charge the corresponding amount of an App in overall extra profit, so 1 $ for the sake of simplicity. D D = This is very feasible but requires some development that is not very straightforward, so 0.9. D = This is very feasible as the technology exists today, so 1. E E = Let’s assume it links to your mission, i.e. 1. E = Let’s assume it links to your mission, i.e. 1. Sort bad from great – The big differences will be easily spotted. Contribute to a healthy discussion – The discussion around the different options and the commitment that follows will help a lot. Continuously refine the evaluation process – If you start with an algorithm instead of just judgmental discussion you can continuously refine and improve your equation. This also prepares you for the introduction of things such as automation of certain parts of your innovation process. The point is that you don’t have to have a perfect assessment process to get started as the assessment process in itself will either way have to be continuously improved. 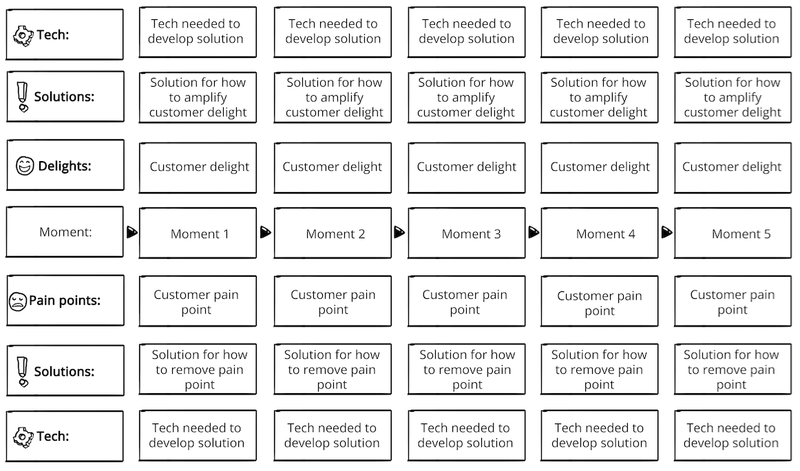 You can use this innovation map to ensure you take an outside-in starting point for innovation in people’s interactions with your industry and business. Great innovators fundamentally challenge the way we think about time. They don’t turn innovation ideas into lengthy projects that may or may not see the light of day. They ask “What would it take?” not “Can it be done?”. So when you think about time, ask what it would take to go from a definition of a challenge to a beta solution that is launched into the market in the same day. Feels scary, right? You might not be able to do it in one day, but just having that as a starting point is going to speed up the innovation process tremendously. If you want to give it a go to go from challenge to solution in one day you can use what is called rapid innovation, rapid prototyping, or pretotyping. The whole idea of rapid innovation is that dragging innovation out over time isn’t necessarily better. Working intensely with everyone in the room can yield surprisingly amazing results in a short period of time. Inspiration: Inspire the group, which can be done in many ways. Host the day in an unexpected location, bring in an inspirational speaker, watch videos of the latest innovation from all around the world. Whatever gets the group going. Data: Fuel the day with relevant data and insights about real people’s behavior. You could for example start off by pretending to be at an art exhibition where you have framed data points plastered on the walls. Everyone could walk around and just breath in all the great data. Challenge: Define what you are solving for. Either this has been agreed before the session or you can workshop it in the session. 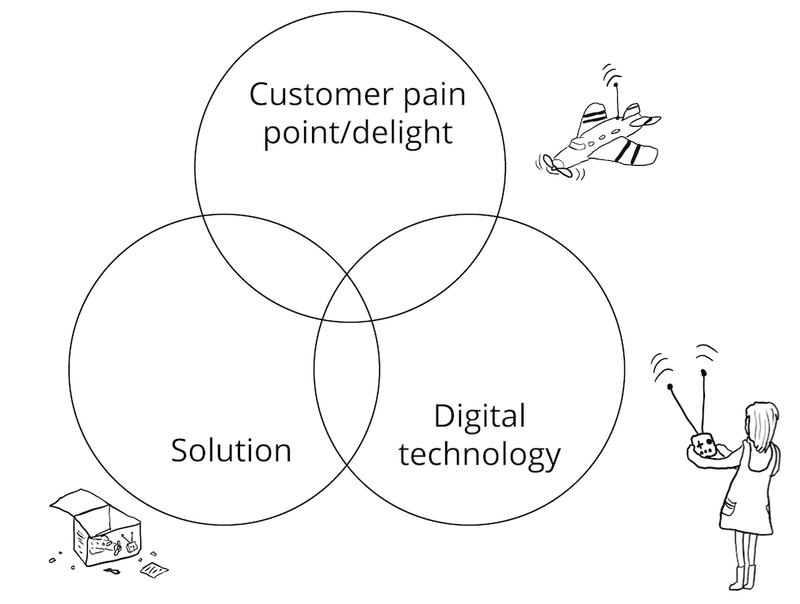 One framework is the pain points and delights of the customer journey as explained earlier in this post. Teams: Split in teams of three. Braindump: Do an individual brain dump where everyone writes down all their ideas on pieces of paper or similar. More ideas is better than less at this stage. Share: Share your ideas in your team of three – Put them up on the wall in your corner and go through them briefly. Nurture: Pick the best ideas in each group and do a “yes and…” each on each idea, i.e. everyone in the team adds a build on each of the best ideas to make them even stronger. Share: With full group your best ideas on the wall. Nurture: Pick the best ideas from the full group and add any builds on them. Prototype: Create a prototype of the best ideas. It could for example be an App, a website, a video or a concept. Field: Go out and talk to real people showing them your prototypes to collect feedback. Regroup: Share back feedback and agree which ideas to launch and who owns what next steps. Celebrate: Do something really fun together to close the day. Be fully present – People are either in or out, nothing in between. You are either there for the full day without your phone or you are not there. Be expansive – Your job is not to kill ideas, but to nurture and grow them. No “but…”, only “yes, and…”. Actionable next steps – Ensure you spend a good portion of time to really discuss and agree on very clear next steps with very clear owners and timings. Otherwise you will lose momentum and the risk of completely dropping the ball and wasting everyone’s time. Have a clear mission – If people in your organization are clear about why they go to work, the innovation will be guided towards a common goal and it will drive motivation. You can read more about the importance of a clear mission here. Sense-check: Would anyone in your organization (including yourself) be able to in 1 min explain why they go to work in the morning in a way that is super motivating to them? Challenge people – If the brief is You own this area, so you need to execute it well or We can’t wait any longer, we need to figure out how to use programmatic marketing, that is not motivating or challenging. Great innovators would say: You need to become the best person in the world at programmatic marketing, what would it take to get you there? A challenging question can completely alter the perspective of a person and enable them to come up with bigger innovations. Test-and-learn fast – One of the biggest insights from X, previously known as Google X, is that the earlier ideas are killed the better. Astro Teller who heads up X talks about this in a TED-talk. In this talk he explains how they created a culture and reward system to for every idea always start by trying to solve the hardest part of how to execute the idea first. If they are unable to do so people are encouraged to kill the idea to make space for more promising ideas. The benefits of this are many. First, this enables X to work through a long list of ideas at rapid pace. It also reduces the financial risk as the vast majority of ideas gets killed at infant stage. Finally it ensures that the ideas that do gets through the first phase will have the resources they need and likelihood to be successful. So try to kill your ideas as early as possible by really putting them to the test and rather continue with very few great ideas than trying to make a business of everything. This starts by immediately jumping into trying to solve the hardest part first with every idea. Procrastination has no place in an innovation culture. Collaborate – Take any innovation and consider which ten or so collaboration partners would make it even greater. Innovation is not something that works best in isolation. One example is Bank of America’s partnership with Khan Academy in making people more financially savvy via the site bettermoneyhabits.com. By partnering with Khan Academy, Bank of America gets to tap into Khan Academy’s vast experience of what it takes to create engaging educational content online. Find a rhythm – To create an innovation culture you need to have some recurrence to your conscious work with innovation. As such, finding the rhythm becomes important. For example, you might have a monthly innovation day and weekly meetings to check in on the development & implementation of what you innovate. An important thing to ensure you make innovation a competitive advantage is making it a core part of everyone’s work. This is all about making innovation part of daily processes, performance indicators, compensation and budgets. Some people might ask if it isn’t a lot of risk involved in investing in total 30% of your resources in innovation? That’s more than 1 day per week for every employee. Well, if we agree that the only thing certain is that everything changes, the question is how we want to define risk? We believe that it’s not only risky, but by mathematics bound to fail to not dedicate part of your resources to innovate what you will make money from tomorrow. As for the processes, innovation needs to be a standing point on the recurring business review meetings you have, for example your weekly business review. It also needs to be part of whatever overall business scorecard you have. There is obviously no one-size-fits-all way to organize for innovation. That said, I want to share one way of doing it that you might want to consider unless you already have something working great. The first thing is to ensure everyone in the organization works with innovation by following the 70/20/10 split of resources recommended in the previous section. That said, for many big organizations creating something truly transformational is close to impossible within existing structures of KPIs, performance evaluations, managing short-term business and the expectations of how to do things. Taking a step back within these structures and saying that we want to do something completely different is very hard and quite often energy-draining for the poor souls that have tried. Ok, let us play with the thought that you would be CEO of a newspaper publisher. What would you have done when you recognized that the industry was about to change? […] To do this I would build up an entirely new parallel organization and let it both find and implement many different solutions. Solutions that will lead the company to new ways of working. Our research results shows that it’s the best way to successfully make a change. There are few companies working in this way today but it’s what I would do if I was the CEO of a newspaper publisher. There are more and more examples of companies that do this, where one of the pioneers was Google with Google X. Founded in 2010 as a division of Google Inc, it is now called just “X” and operates as a subsidiary of Alphabet Inc.
MTGx is a great example of when someone tries to break out part of the business to act as a sparring partner to the main business. I’m not judging whether they have been successful or not, but they acknowledge that you need to break out of existing structures to gain the space and freedom to disrupt. At the end of the day, the question is simple: Who would you rather see win – a competitor you own or a competitor you don’t own?